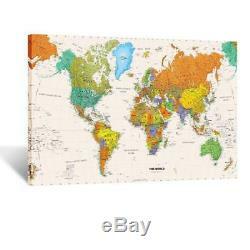 Kreative Arts - Large Size World Map Wall Art Framed Art Print Picture Wall Decor Home Interior - Map Picture for Office Wall Decor 48x32inch (Stretched Canvas). Product Dimensions: 48 x 1 x 32 inches. High Quality Glossy Canvas with long lasting durability Printed at high resolution using the latest state of the art colour technology ensures sharp & vivid images every time. Professional artwork is used for a sharp hi-resolution image. 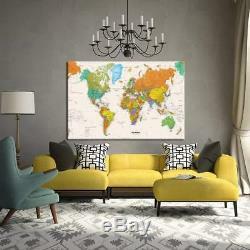 Size:48x32''(120x80cm) Affordable Museum Quality Stretched Canvas Ready to Hang. 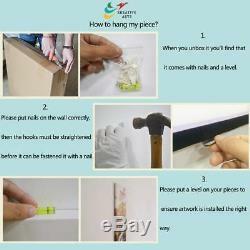 The Canvas has been expertly stretched (gallery wrapped)over 1 1&###x2F;5''(3cm) wood frames which come ready to hang with hooks. We inspect the artwork in every step of the finishing process, and then carefully pack your artwork to make sure it reaches you in the finest condition. QUALITY CANVAS PRINT FRAMED AND READY TO HANG 1. An imported high quality pine and stretched canvas frame is combined with waterproof ink printing technology to make these exquisite prints. This Canvas Art Print will look stunning on any interior wall. We focus on every detail of production. Our inkjet printing techniques produces illustriously detailed prints. Ordering prints from Creative Art means ordering quality and getting 100% satisfaction. 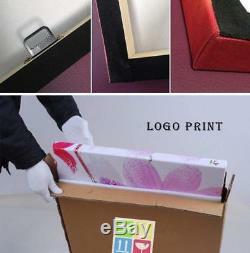 Our canvas prints are handmade by real means real eyes inspecting our artwork and real hands framing it with care. 100% LOVE GUARANTEE Means either you love it or we'll make it right. Satisfactions isn't enough for us. IMPORTANT Please note - Photos shown in sample settings are not completely dimensional to their surroundings. Please double check sizes above to insure your satisfaction. 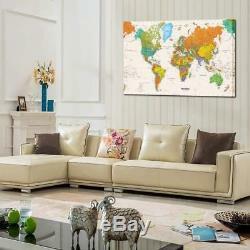 The item "Kreative Arts Large Size World Map Wall Art Framed Print Picture Decor" is in sale since Sunday, August 26, 2018. This item is in the category "Home & Garden\Home Décor\Posters & Prints". The seller is "tigerspecials" and is located in US. 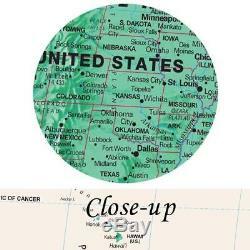 This item can be shipped to United States, Canada, United Kingdom, Denmark, Romania, Slovakia, Bulgaria, Czech republic, Finland, Hungary, Latvia, Lithuania, Malta, Estonia, Australia, Greece, Portugal, Cyprus, Slovenia, Japan, China, Sweden, South Korea, Indonesia, Taiwan, South africa, Thailand, Belgium, France, Hong Kong, Ireland, Netherlands, Poland, Spain, Italy, Germany, Austria, Israel, Mexico, New Zealand, Philippines, Singapore, Switzerland, Norway, Saudi arabia, Ukraine, United arab emirates, Qatar, Kuwait, Bahrain, Croatia, Malaysia, Brazil, Colombia, Costa rica, Panama, Trinidad and tobago, Guatemala, Honduras, Jamaica.